Australian researchers have devised a new x-ray imaging method that will speed up the development of effective new treatments for cystic fibrosis. The non-invasive imaging method allows researchers to look at soft tissue structures such as the brain, airways and lungs, which are nearly invisible in conventional x-ray images. Developed by Dr Kaye Morgan from Monash University (pictured above at the Australian Synchrotron), the new method uses synchrotron x-rays to measure ‘live’ how different treatments affect the airway surface. Researchers currently have to wait several months to see whether a CF treatment has had a positive impact on airways and lung health. The new method will enable doctors and researchers to progress new treatments to the clinic much faster, a key goal of co-authors Dr Martin Donnelley and Dr David Parsons of the CF Gene Therapy group at the Women’s and Children’s Hospital and the University of Adelaide's Robinson Research Institute. Kaye was joint winner of the 2011 Australian Synchrotron Thesis Medal for her PhD research into the new imaging method. 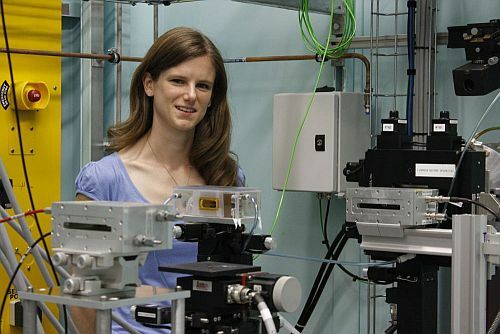 Her research group uses the Australian Synchrotron and the SPring-8 synchrotron in Japan. The two facilities have similar capabilities, with SPring-8 able to produce more-narrowly-focused x-ray beams.